As a major U.S. city, Washington can be a little overwhelming to new visitors. 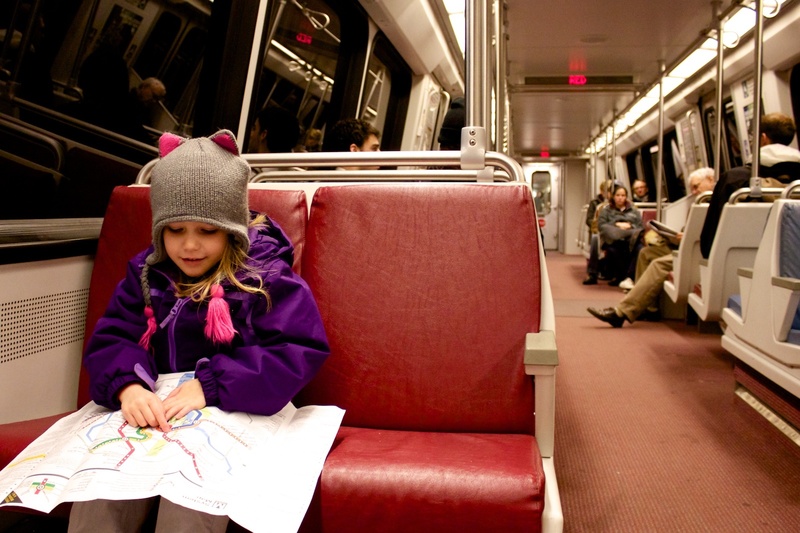 One of the ways to make it more manageable, though, is by utilizing the D.C. subway system–called the Metro. 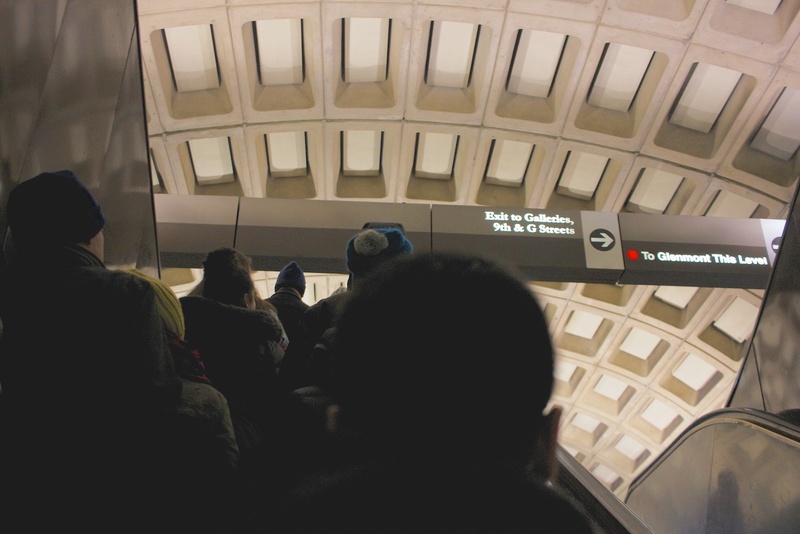 Using the Metro, however, can itself be intimidating, especially to visitors who do not have a mass public transportation option in their hometown. Fear not intrepid readers, the Metro is fairly easy to understand and, after reading this guide, you will surely be riding like a local. 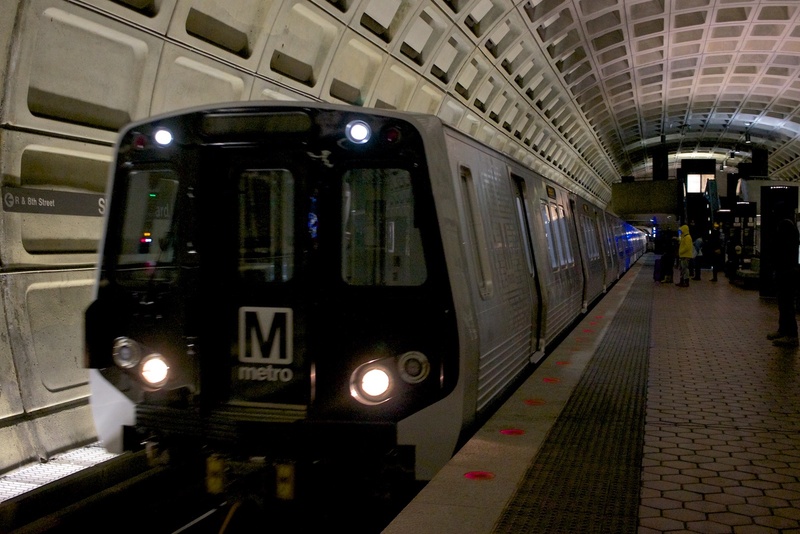 Special Service Note: Metro is currently undergoing a multi-year restoration project entitled SafeTrack. Closures, adjustments, and delays are common, but often scheduled in advance. 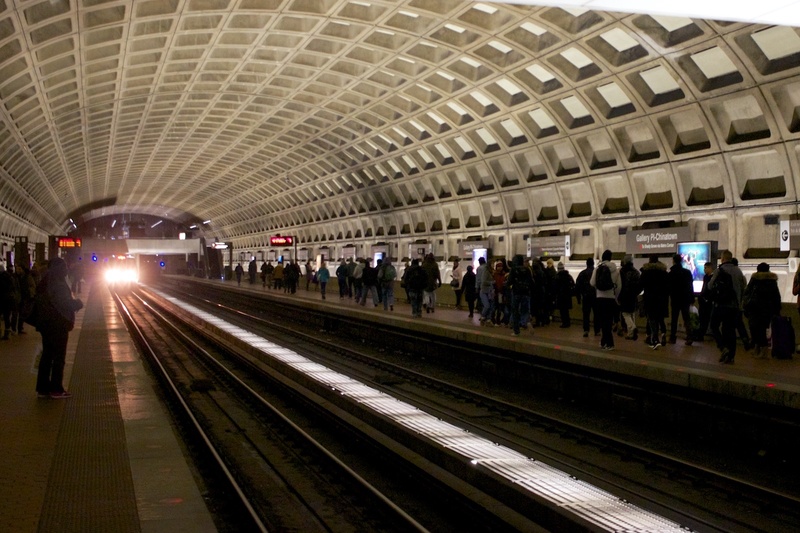 Save yourself a headache by checking out the WMATA SafeTrack website before your trip. 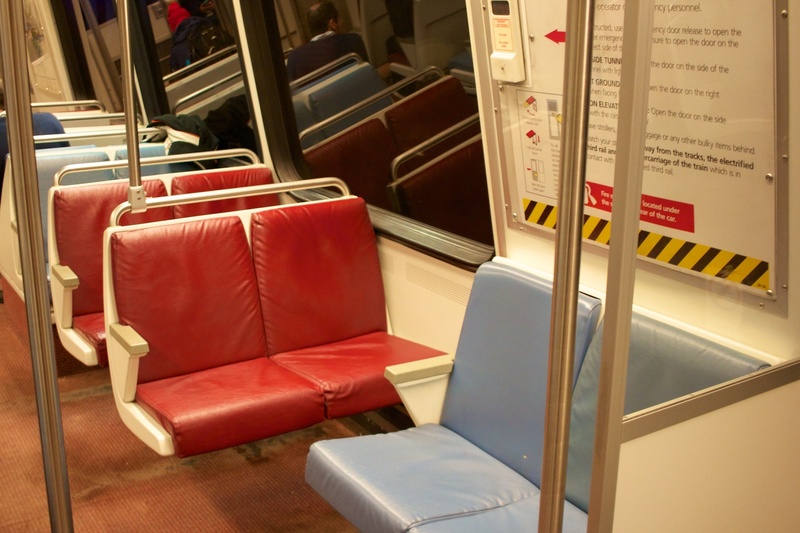 Below are the detailed steps to riding the Metro, but first a few background items. 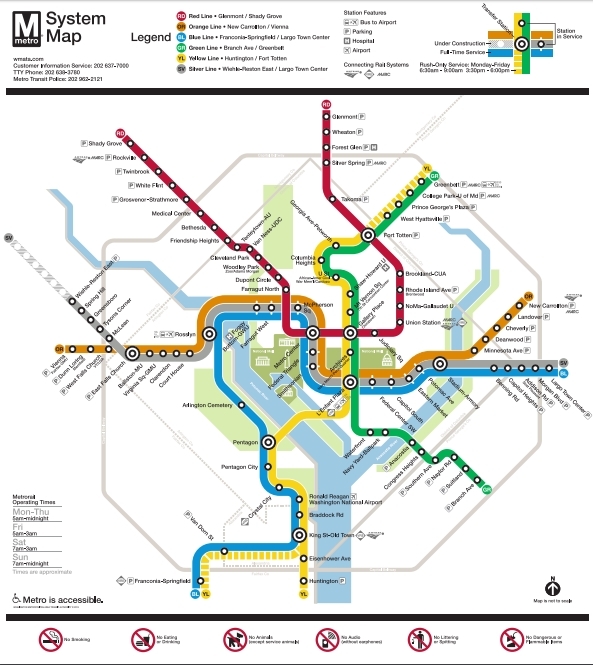 Okay, technically the Metro system is all bus and rail under the authority of WMATA (Washington Metropolitan Area Transit Authority), but whenever someone says “the Metro,” they mean the subway. Of course, the Metro isn’t always underground either. Once it gets out of the urban areas, it often pops its head out and begins to scamper above ground. Metro gets a lot of grief from locals. 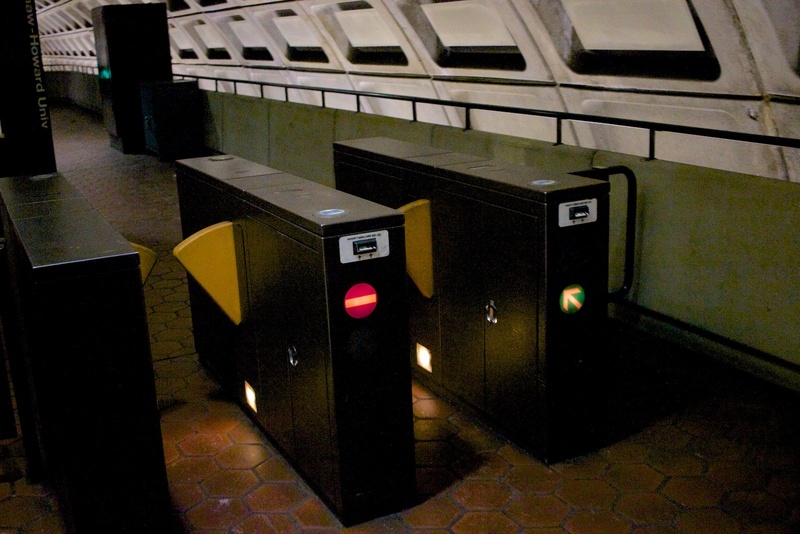 The system has frequent delays, occasional mechanical issues, and seemingly constant escalator and elevator outages. On top of that, the weekend track work and station entrance closures can make a well-designed plan meaningless. Even with all that, we feel that it’s pretty darn good. Yes, all of the problems listed are real, forever annoying, and–if you have to ride it every day–maddening. 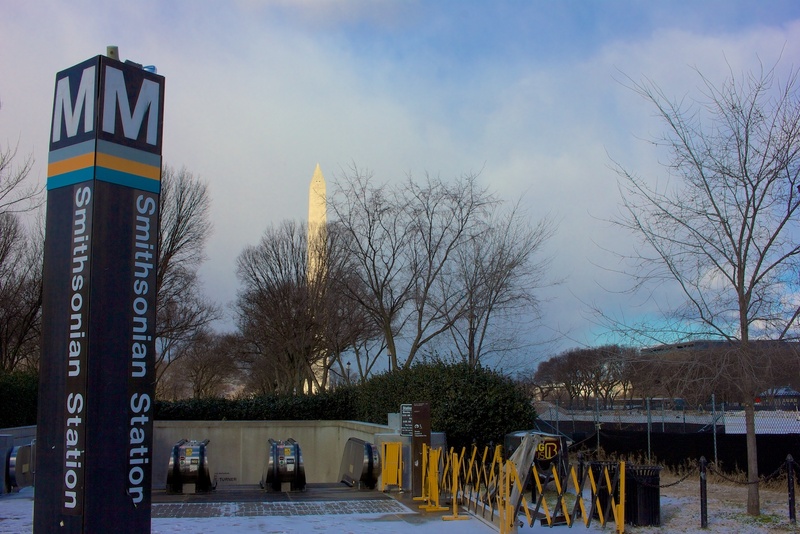 Luckily, as tourists to Washington, you do not have to deal with the Metro’s flaws every day so can take it for what it is, a very efficient way to move about a very congested city. We would love to say “EVERYWHERE” except that isn’t true. Looking at the Metro map does make it look like its tendrils stretch into every conceivable neighborhood in D.C., Northern Virginia, and nearby Maryland counties, but on closer inspection there are massive gaps. Want to visit Georgetown University? Well, its landmark Healy Hall is a solid mile-and-a-half away from the nearest Metro stop. What about the Lincoln Memorial or Jefferson Memorial; surely these super-popular tourist sites are close to the subway! Nope. Each is just shy of a mile from the nearest Metro. There are, of course, other means of getting there including the affordable buses and services such as Uber and Lyft, but that is a discussion for another page. 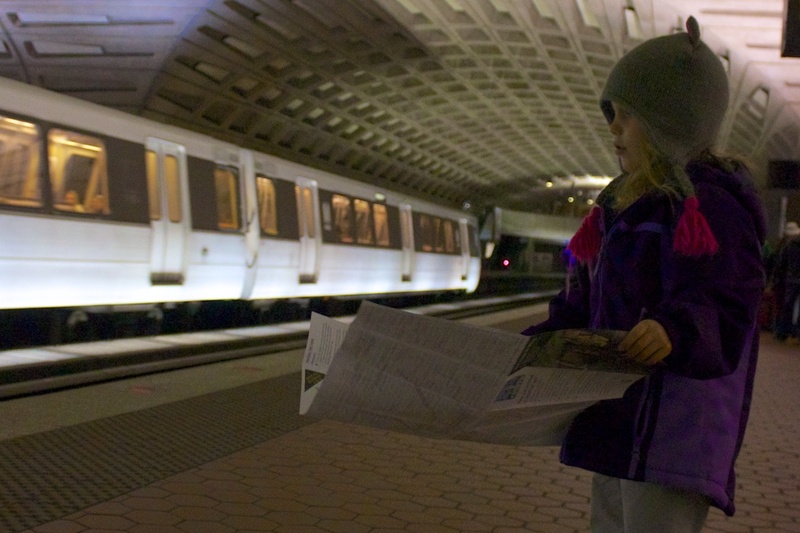 The point is: don’t assume the Metro goes where you want it to. It is an invaluable means of getting around for tourists, but get familiar with the map and it will save you a surprise later. Some stations have multiple entrances. 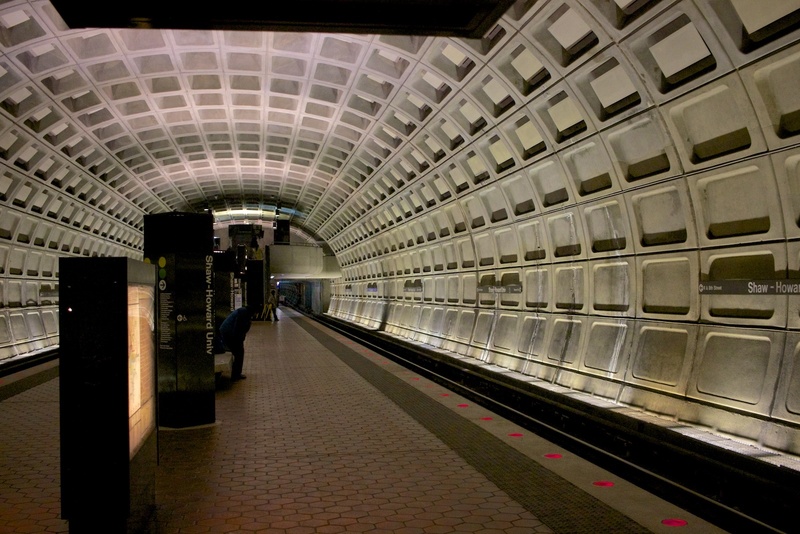 For example, let’s look at Metro Center, one of the most popular stations. 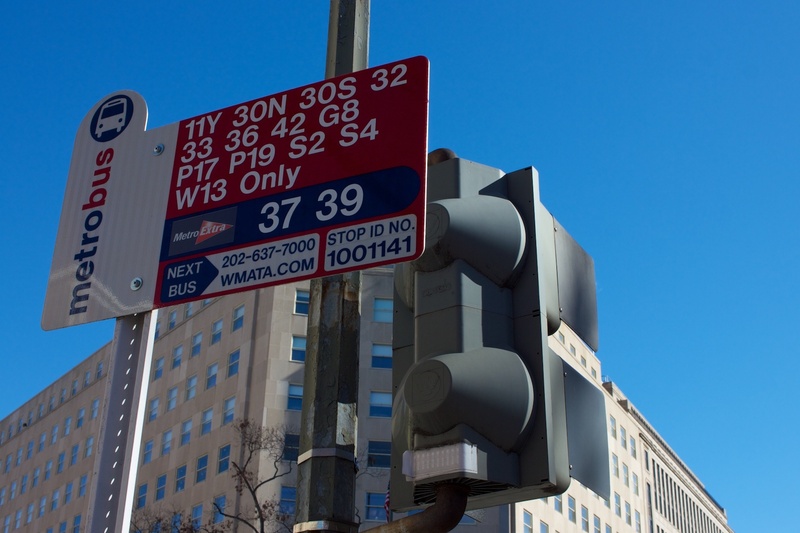 It is right downtown and acts as a transfer point between the Red, Orange, Blue, and Silver lines. It has 4 entrances. 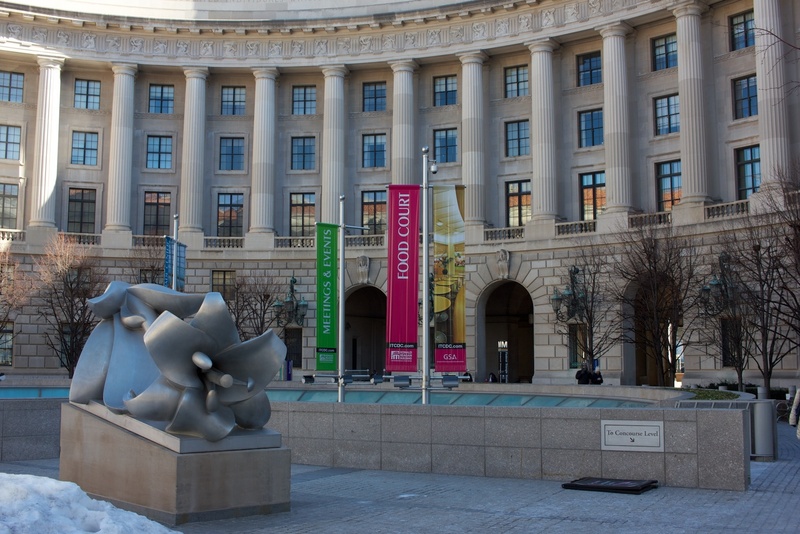 Metro Center’s official address is 607 13th St NW, and there is an entrance near there (on the corner with G St). On Google Maps, it shows Metro Center on the corner of 12th and G, the site of another entrance. There are also entrances on 11th and G and 12th and F Streets. While they all lead to the same station, you can save yourself a few extra blocks by knowing the entrances. 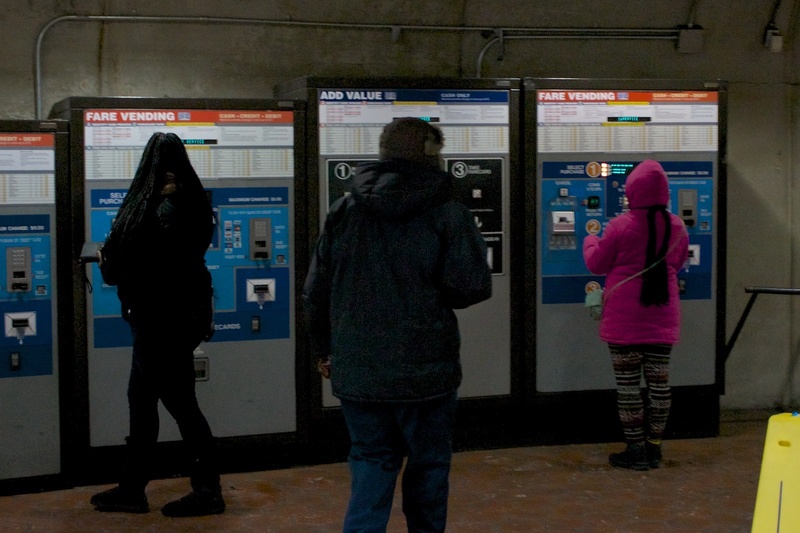 The WMATA stations list helpfully tells you all of the entrances to every station. 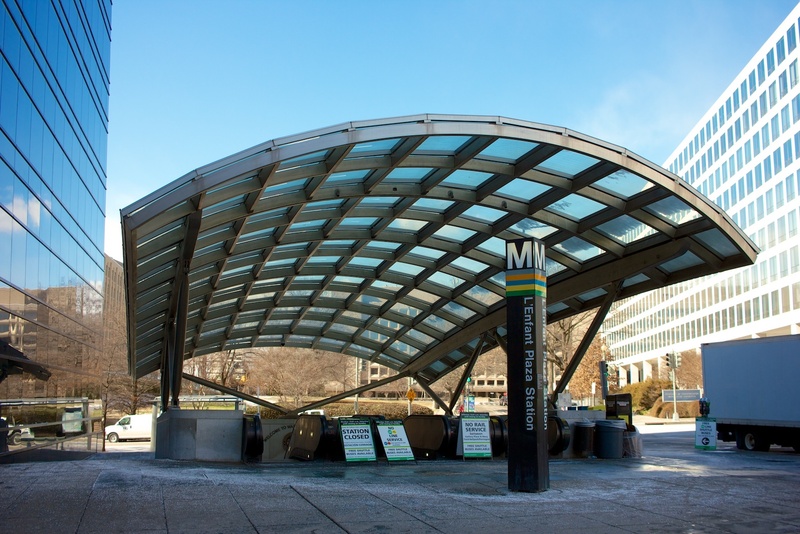 The area north of the Mall has the most Metro stations, and there are some areas where there can be two or more stations all within close proximity. 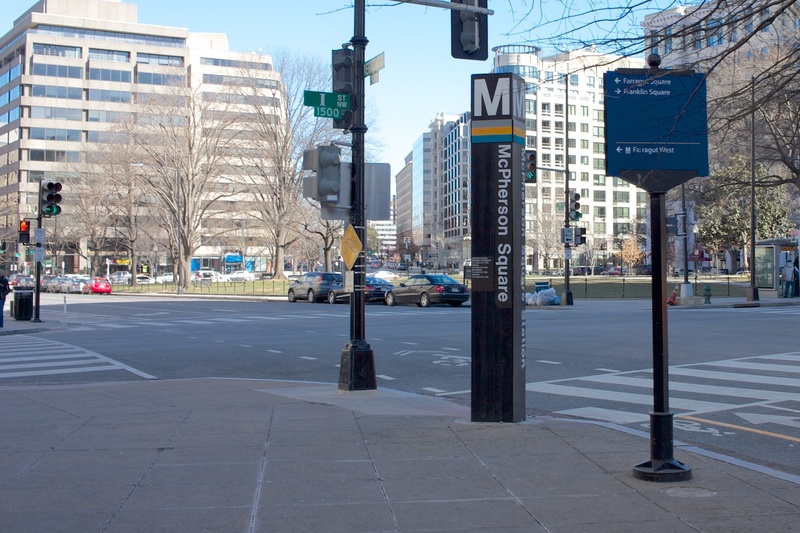 The best example is on Farragut Square, where there are two stations: Farragut West and Farragut North. 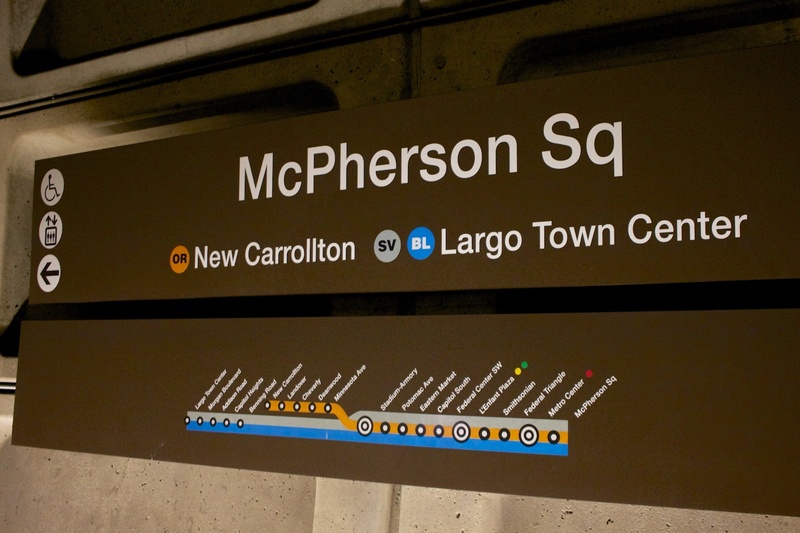 Farragut West is on the southwest corner of the square (with another entrance one block further west) and services the Orange, Blue, and Silver lines. Farragut North is one short block north and services the Red line. Make sure you know the exact name of the station you want and what line you’re looking for. In cases like this, the Metro post can help. 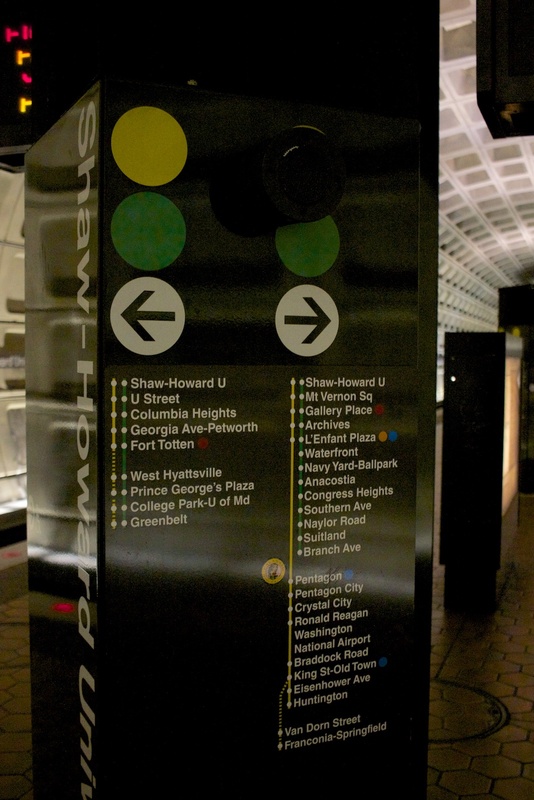 Not only do they have the white M and station name, but also bands of color under the M to represent the lines found in the station. While the Metro does a good job of marking their entrances with the ever-present brown post, the actual entrances are sometimes hard to see. Often they are just a gap in a building with escalators inside. Of course, every so often there is a station that is almost completely hidden. The useful Federal Triangle station is the latter. 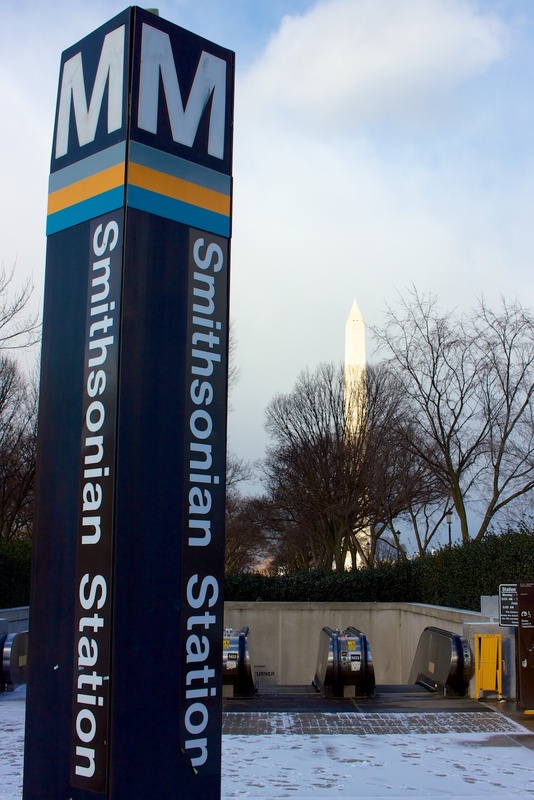 It is a Orange, Blue, and Silver station only one block north of both the Museum of American History and Museum of Natural History. 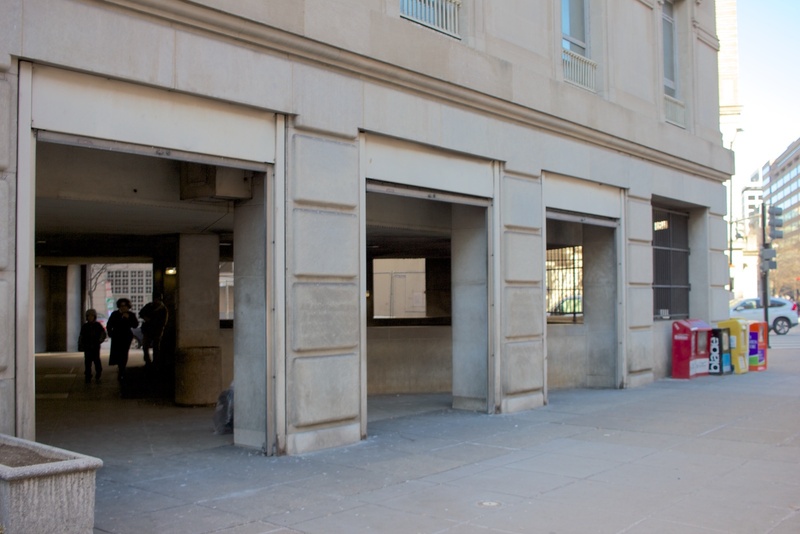 While there is a post on 12th St, the actual entrance is in a breezeway in the U.S. Postal Service building. If you walk into the courtyard, the entrance is even harder to find, simply a distant post off under the building. Now that you’re finally in the station, you have to get on the train. 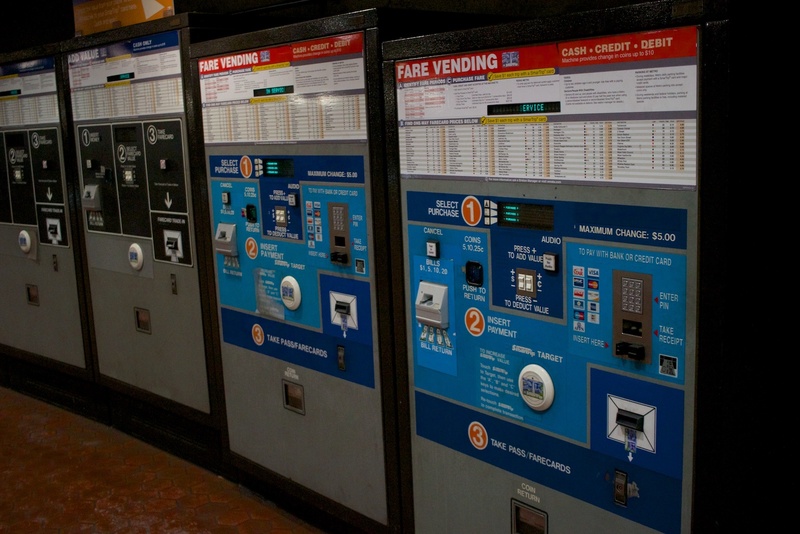 To do that you will need a SmarTrip card: the plastic, rechargeable fare card required to ride the Metro (paper cards were phased out just recently). 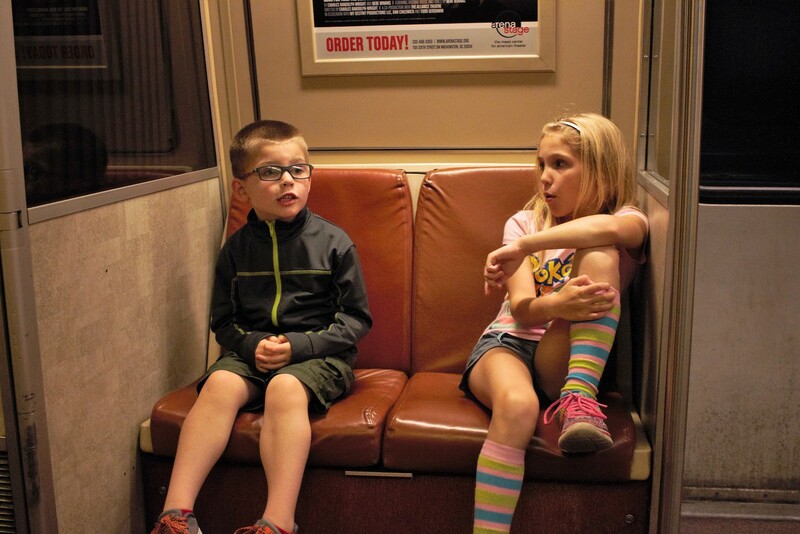 We are personally fans of the way Metro uses their SmarTrip cards. For one, they can be purchased online and sent to you (a $2 service fee applies to new purchases plus th $5 fee for a new card) and the value can also be refilled online. For frequent visitors, you can even set up automatic reloads (minimum $20 reload) via the WMATA website. If you don’t get one sent to you, they can still easily be purchased or reloaded at any station. Usually near the bottom of the escalators are a bank of machines with blue and black faces. For a new card, you will need to pay a $5 new card fee. Once you have your card, it can be recharged easily at the blue-faced machines by following the orange-circled 1, 2, 3. Attendants are usually nearby although most will do no more than point you to the correct machine. 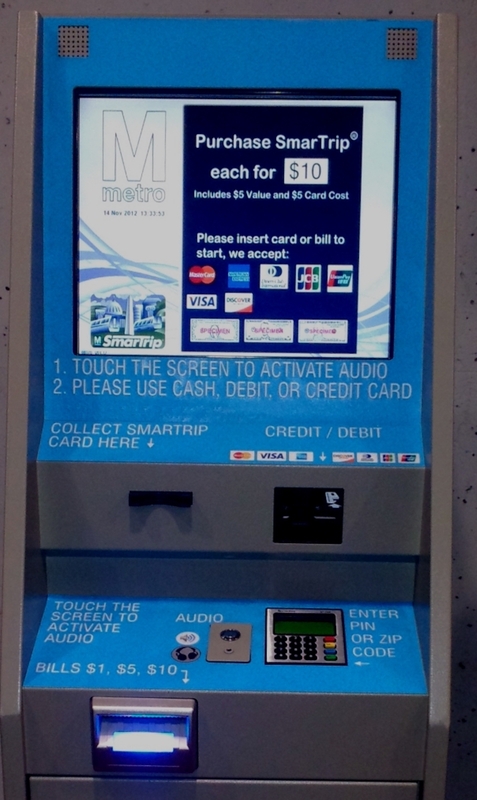 Once you have your SmarTrip card ready to roll, you simply touch it to the blue circle on top of the turnstile and the gate will open. A display on top will also tell you the amount of money on your card. 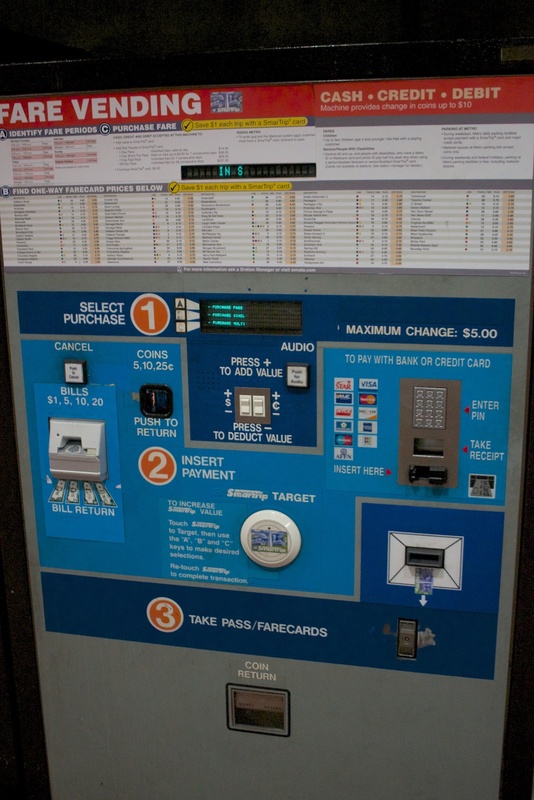 You will also need your card to exit a station, where the display will also tell you how much the fare was (it varies depending on time of day and length of trip). First, a very important point when riding the Metro: Know the final station in the direction you are traveling. 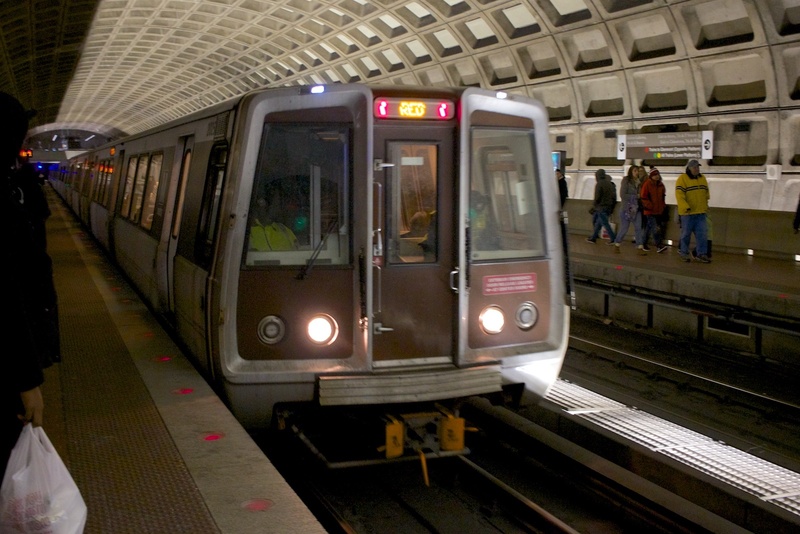 For instance, if you are on the Red line going from the National Zoo (Woodley Park-Zoo Station) to the Metro Center Station, the train will not say a direction. What will be listed on the train is its final destination, which, in this case, will usually be Glenmont. To throw a wrench in that, during rush hours the Red line is often shortened, so some of the trains may say Silver Spring. Don’t worry, it’s not as hard as it sounds, just look at a Metro map (they’re everywhere and you can get a brochure with one at any station). First, find the station you’re at, trace your finger to the one you are going to, then keep tracing until you get to the end of the line. That’s the station name to look for on the signs. Once you get to the platform there will be additional signs listing the stations so you can double-check. Now, there are a few different ways that Metro stations are set up. The simplest is a station that services a single line with a platform in the middle. Everyone goes to the same place and trains arrive on both sides. Then there are the stations that service a single line, but with platforms on opposite sides and the tracks in the middle. The most complex are the transfer stations, where multiple lines are serviced. These require multiple floors and escalators. 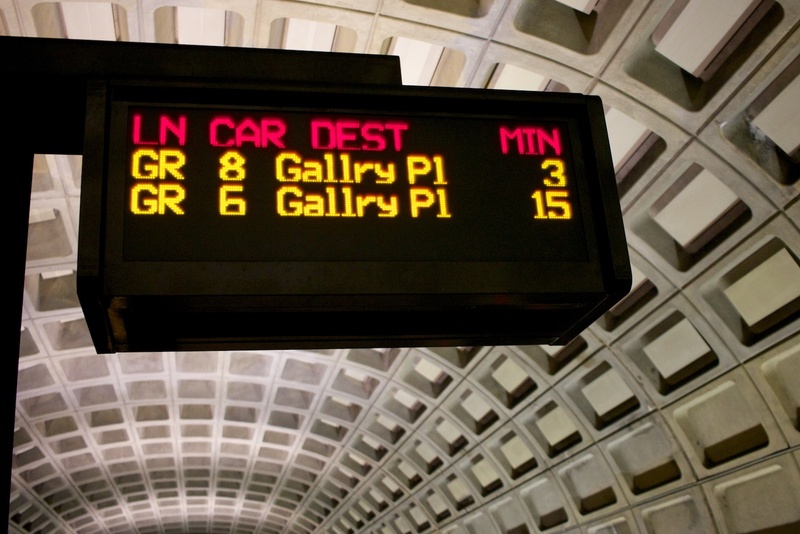 Before you get worried, one of the things Metro does fairly well is signs. If it is a shared, central platform, signs on the walls tell you all the stops for each side. 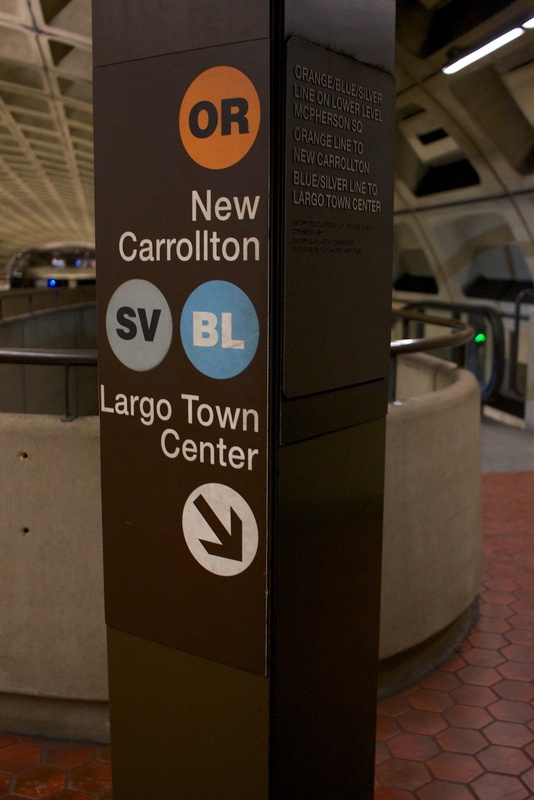 For other configurations there will be signposts listing the line colors, end stations, and all the stations along the way, with arrows pointing the direction you need to go. Also found on the platform is a handy, if often frustrating wait time board. It tells you the color of the train coming, its final station, and how long until it arrives. When the train approaches there will often be a bit of a rush. Don’t worry, it’s usually pretty orderly. Stand to the side of one of the doors until (most of) the people exit, then step in and find a seat if you can. Be warned that some of the seats will be facing backwards if you’re prone to motion sickness. The stations will be announced, but in true subway fashion, the announcements are often hard to hear. 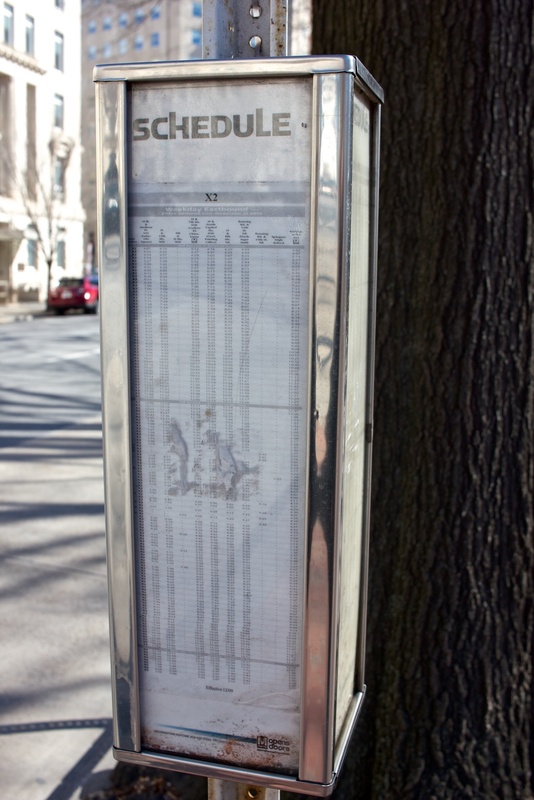 Keep track of your progress by checking the signs at each station you stop at. 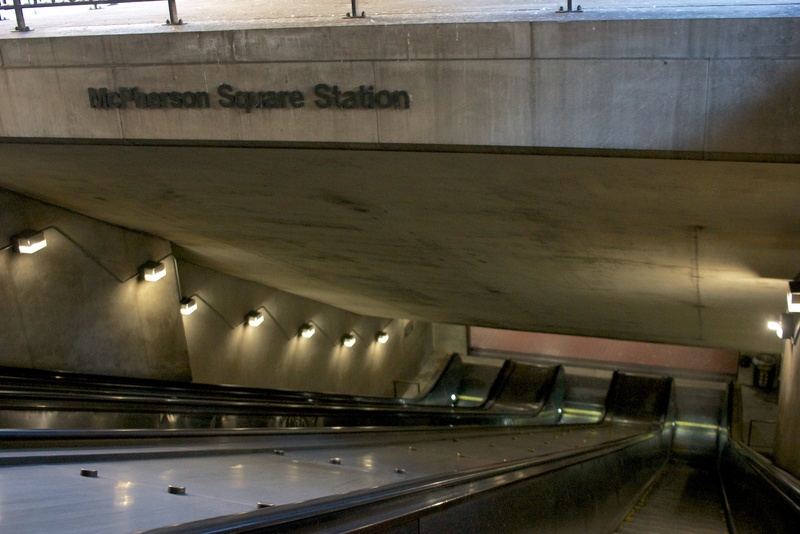 As mentioned above, most stations have multiple exits. Walking out of the correct one can keep you from getting turned around and save some time walking in whatever weather happens to be outside. There are signs to guide you, although they usually only have street names on them, so a rough idea of your destination is necessary. 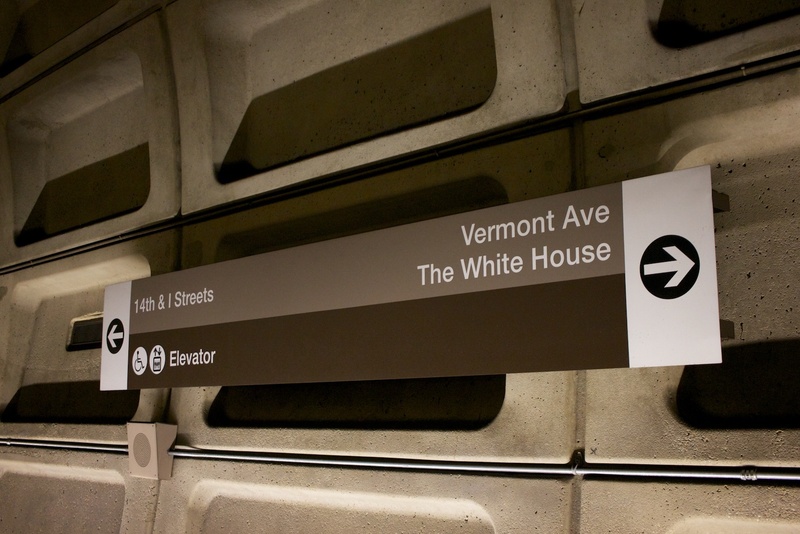 Even if they do have something like “The White House” on them like the one at the McPherson Square station does, know that the exit is actually at Vermont Ave and I St NW, a full 2 blocks from the North side of the White House. If you were using that station to arrive for a White House tour, you would be about 1/2 mile away. 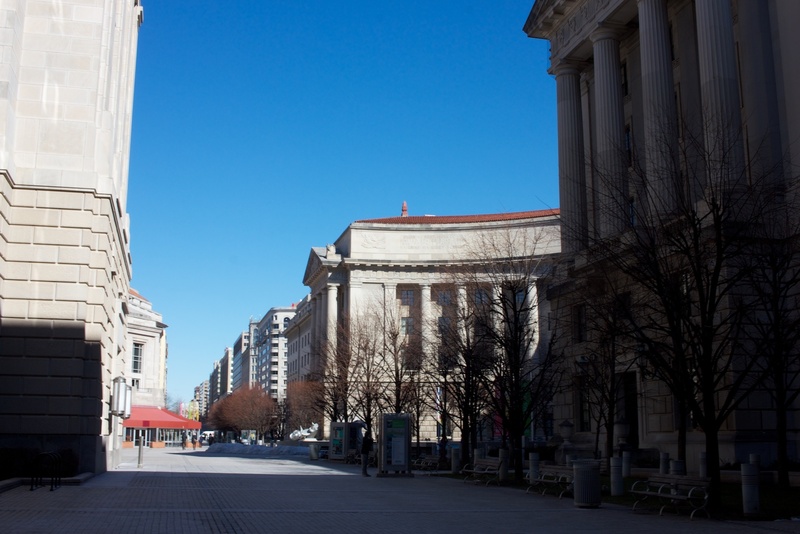 Like all major cities, Washington, D.C. has issues with public safety now and again. If you are in the major tourist areas during normal tourist hours you are very unlikely to have any trouble. Late at night or in lesser-trodden areas you may find yourself either alone or surrounded by people out for a party. No matter the situation, stay vigilant. There is security in Metro stations, but it is not highly visible. Like, really long. 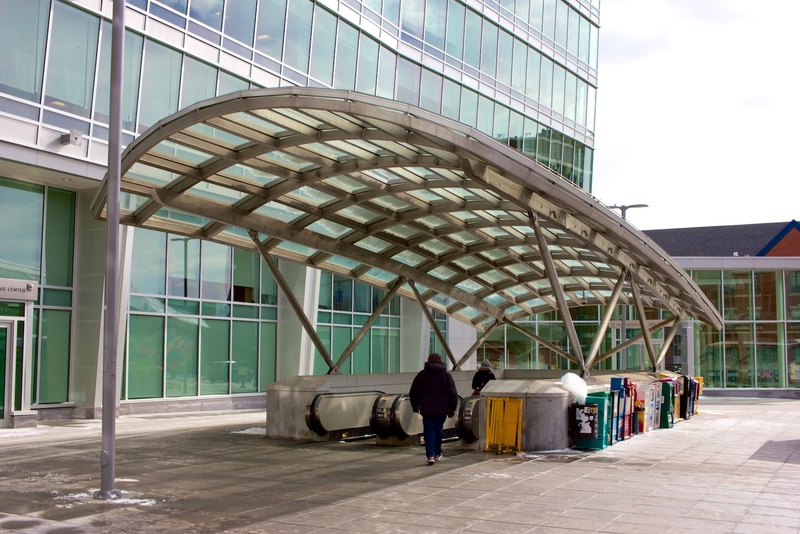 The Wheaton Station on the Red line boasts a 230-foot long escalator that brings you 115 feet vertically. 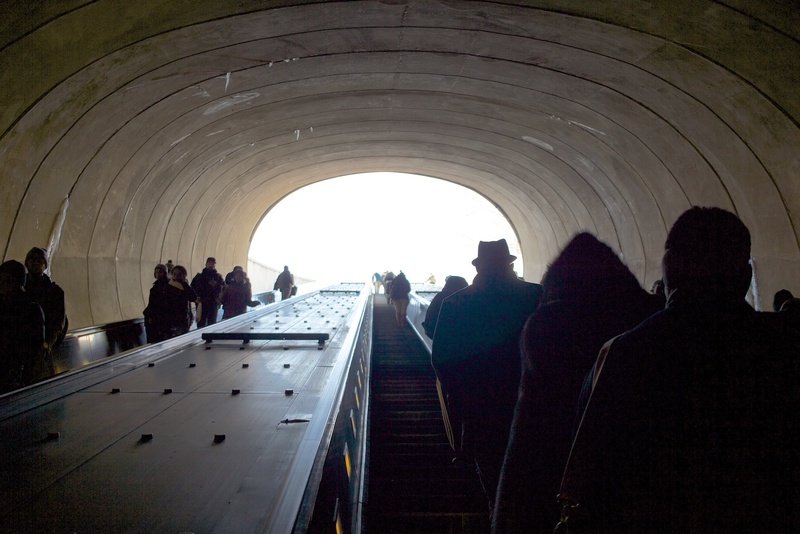 It is the longest escalator in the Western Hemisphere. In addition, there are 7 other stations with escalators exceeding 160 feet in length (most along the Red line). Beware if you have vertigo. Speaking of escalators, there is literally nothing that will enrage regular Metro users like people standing in the way on an escalator. No matter how tall or how small the escalator is, many people prefer to walk up or down. The rule is simple: walk on the left, stand on the right. Do. Not. Violate!